Are you fascinated by shipwrecks? Do you want to go in search of hidden treasures and historical artefacts? Well wreck diving has it all. Submerge yourself in history and encounter beautiful marine life at some of the most famous dive sites in the world. We have gathered together below examples of our holidays where you can see some of the most impressive and intriguing wrecks in the world. Some of these holidays have itineraries dedicated to exploring these wrecks and others give you the opportunity to experience wreck diving along with some stunning reef, drift and wall diving. Cyprus is home to the best wreck dive in the Mediterranean, the Zenobia. 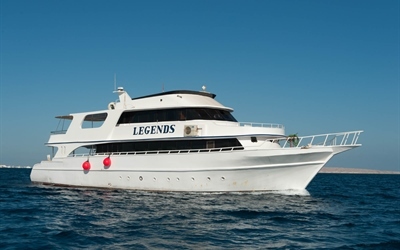 Cyprus Diving Adventures have been diving the Zenobia for over 12 years and consider themselves Zenobia specialists. The Zenobia, a roll-on roll-off ferry, sank in 1980 less than one mile from shore where she now lies on her side just outside Larnaka harbour. She is surrounded by a marine reserve which is home to an abundance of marine life including turtles, barracuda, tuna, jacks, shoals of bream, lionfish, trumpetfish, triggerfish and nudibranchs to name but a few. The Zenobia was transporting over 120 vehicles, which can still be seen, along with two propellers, funnels, bridge, cafeteria, accommodation, the engine room and much more. 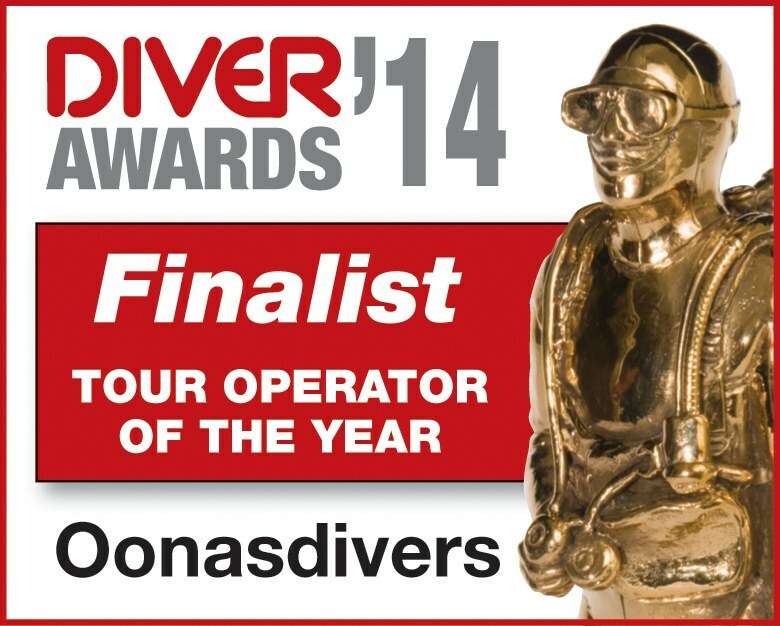 This is a great dive site for divers of all levels. Other points of interest are the Limassol wrecks, Constandis and Lady Thetis. These wrecks are part of an artificial reef program in Cyprus where the mixture of wrecks and reefs have attracted a fantastic selection of marine life. Aphrodite Gardens is just one of the resorts we have on offer in Cyprus, there is an fantastic variety of accommodation available to suit different budgets and tastes. Malta and Gozo are an excellent choice of destination for those that love wreck diving, there is a good mix of purposely sunk wrecks along with historic shipwrecks, submarines and aircraft offering both recreational and technical diving options. Most of the wrecks in Malta are easily reached from shore. For those wanting deeper wrecks you will find the Blenheim Bomber, Stubborn Submarine, Imperial Eagle, Mosquito, Beaufort fighter and Polynesian amongst others. 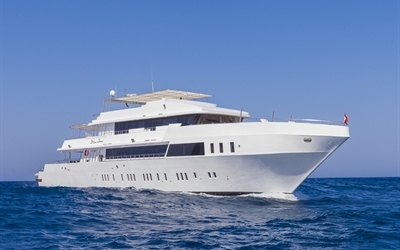 Um El Faroud was severely damaged by an explosion and, after being declared a write-off, was towed out to sea and sunk as an artificial reef near Qrendi in Southern Malta. She has become one of the most popular wrecks in the Mediterranean, and her configuration makes her perfect for penetration dives. Decommissioned ships have been scuttled off Gozo’s South coast, near Comino’s Blue Lagoon and Malta’s north coast. One wreck in particular was scuttled in shallow water purposely to be enjoyed by less experienced divers. MV Karwela is possibly the most popular of the wrecks around Gozo, she was scuttled along with MV Cominoland, MV Xlendi lies just to the west of them. You will see details below of self-catering accommodation for both Malta and Gozo. 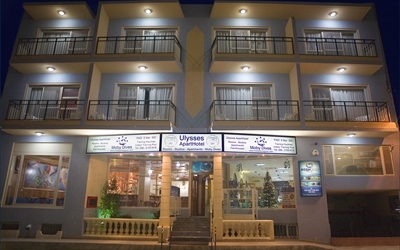 Ulysses Aparthotel is situated onsite at Moby’s Dive Centre in Xlendi, Gozo where the bay is just 2 minutes away and a wonderful place for swimmers, snorkellers and divers with its sandy beach leading into shallow waters. 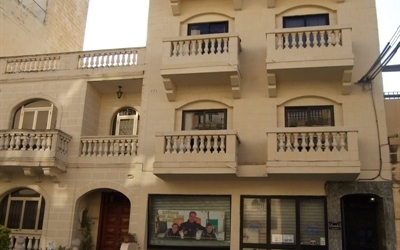 Sands Apartments in Malta are just 100 metres from Maltaqua Dive Centre and close to all amenities. The Northern Red Sea is renowned for wreck diving and is home to what is considered by many as the best wreck dive in the world, the SS Thistlegorm. 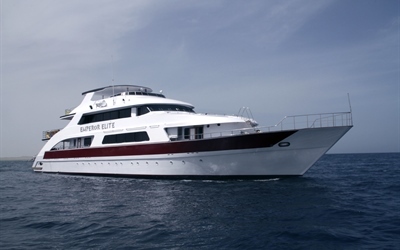 To reach these sites in comfort we would suggest a liveaboard safari. 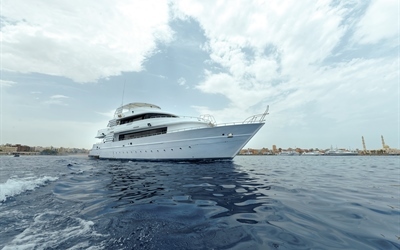 The reef of Abu Nuhas in the Red Sea has 4 diveable wrecks, Kimon M, Chrisoula K, Carnatic and Giannis D. At Gubal Island you can dive the Rosalie Moeller, the Barge and the Ulysses moving onto the Kingston at Shag Rock and the Dunraven at Beacon Rock situated in the Ras Mohamed National Park. Here you will find big fish and steep walls covered in coral and in between Shark and Yolanda reefs lies the Yolanda. From here you will encounter the most famous wreck in the Red Sea, the Thistlegorm. These wrecks are quite spectacular and a popular choice for underwater photographers particularly the Carnatic as it is covered in corals. The fascinating World War II wrecks, Thistlegorm and Rosalie Moeller offer many photo opportunities and an intriguing glimpse into the past. 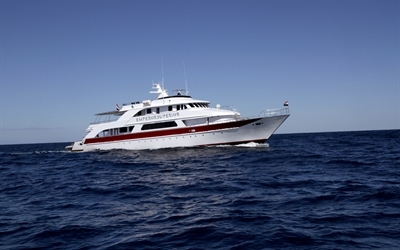 The Salem Express lies between Hurghada and Safaga and holds some controversy due to the loss of life resulting in it being one of the biggest marine tragedies. On the walls of Big Brother you will find the Aida II and Numidia, these wrecks are covered in soft and hard corals. The Brothers Islands are pinnacles of two undersea mountains and offer stunning wall diving, you are almost guaranteed to come across grey reef sharks and on occasion oceanic white tips and silky sharks along with hammerheads and mantas. 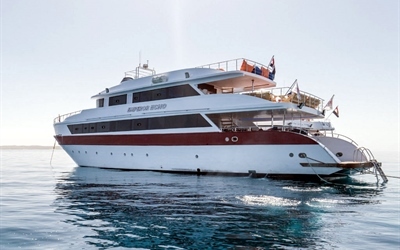 Below you will see a selection of liveaboards offering a range of itineraries to choose from, they cater for individuals aswell as larger groups wanting a full charter. Sudanese waters are possibly the most beautiful and wildest in the Red Sea with many of its dive sites steeped on historical significance. The reefs are pristine and there is a healthy shark population making this destination a thrilling place to dive. The Umbria, a large passenger-cargo vessel, was sunk in 1940 by the Captain to avoid the British taking ownership of their precious cargo of war-like commodities and ammunition, she lies on her port side at Wingate Reef. The remains of the masts are visible above water and the wreck is almost completely intact and covered in beautiful coral. 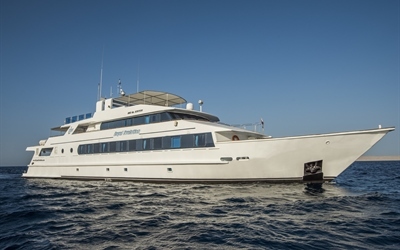 You can explore Sudan from the Royal Evolution liveaboard, listed below. 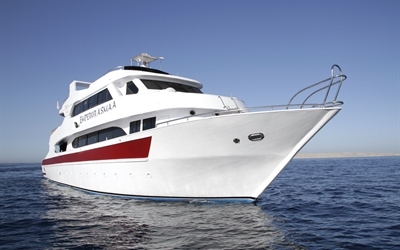 This boat is one of the most sophisticated on the Red Sea and during the 13 day cruise you will take up to 42 dives in total.